Ethnic rebellions have been hounding Myanmar or Burma ever since it became independent from the British in 1948. A hodgepodge of ethnicities, Myanmar had secured sovereignty and “Nation State” status without first ensuring internal integration or “nationhood”. But Myanmar is not alone in this. This is so in many countries which emerged with the dismemberment of the British Empire, including India, Pakistan and Sri Lanka. But while India, Pakistan and Sri Lanka have, over years of strife and struggle, found ways of containing or managing ethnic discontent, Myanmar is still depending on brute force to keep the country together. The failure of democratic institutions and the military take-over in the early 1960s, further fuelled ethnic conflicts. With the State machinery and the armed forces (called Tatmadaw) firmly in the hands of the majority community, the Bamar Buddhists who are 68% of the population, others groaned and complained of neglect and exploitation and fought back with arms. While it should come as no great surprise that non-Buddhist communities such as the Kachins and the Rohingyas complained of neglect, discrimination and even active persecution, the largely Buddhist Arakanese and Shans also had complaints of a similar nature which led them to take up arms. In recent years, the plight of the Rohingya Muslims of Rakhine State in North Western Myanmar had gained international attention following the systematic persecution and mass expulsion they were subjected to by the Myanmar State on the grounds that they were Bangladeshi immigrants and not indigenous Myanmarese. But while the Rohingya issue is thawing somewhat because Myanmar had to stop the cruder forms of persecution under international pressure, another conflict has come to the fore. Arakanese Buddhists, also called Rakhine Buddhists, are fighting the Tatmadaw with modern weapons. Their spearhead is the Arakan Army popularly known as AA. The Arakan Army’s grievance is that the two million Arakanese Buddhists are being discriminated against by mainstream Bamar Buddhists ensconced in power in the national capital, Yangon. The Arakan Buddhists and the Arakan Army consider the “Bamar” to be “colonial oppressors.” “Arakan is ours. If the Myanmarese go back to their native place there will be no fighting,” said Khaing Thu Kha, the Arakan Army spokesman in an interview to the media. On January 4 this year, Myanmar’s Independence Day, 350 cadres of the Arakan Army carried out co-ordinated assaults on four posts manned by the Myanmarese paramilitary Border Guard Police in Buthidaung Township in Rakhine state, close to the border with Bangladesh. The rebels killed13 policemen and made away withscores of weapons and ammunition before army reinforcements struck back with two attack helicopters and infantry columns. At least one post was overrun by rebels using newer AK-series assault rifles, machine guns and sniper rifles and not rudimentary assault rifles and small-arms, and home-made crude Improvised Explosive Devices (IEDs) as before. The Arakan Buddhists’ taking up arms against it shocked the Myanmarese army. For it was the Tatmadaw which had nurtured the Arakan Army to help it intimidate and drive out 700,000 the Muslim Rohingyas of Arakan into Bangladesh. As in many other cases the world over, an armed group nurtured by the State or government, eventually turned against its creators or sponsors. What is more shocking is that the Arakanese Buddhists have teamedup with the Christian Kachins to fight fellow Bamar Buddhists.The Arakan Army has been conducting joint operations with the Kachin separatist army. Unlike the Muslim Rohingya, the Arakanese Buddhists are officially recognized by the central government as an ethnic minority. But still, they feel marginalized. This is because historically, Myanmar has been dominated by the Bamar ethnic majority based in Central and Southern Myanmar. Myanmar’s inability to forge its various ethnic and religious groups into one nation has led to peripheral groups demanding either a confederation or outright independence in the last 70 years. Like the Kachins and Shans, the Arakanese Buddhists also want self-determination and independence. They want the restoration of the independent Arakan State, which existed till 1785 when the Bamar Buddhists occupied it and took away the sacred golden Buddha statue known asMahamuni. Even today, Rakhine Buddhists mourn the sacking of their capital city by the Bamar army in 1785 and the seizure ofMahamuni. At present, the Rakhine Buddhists feel that their region and their economic and political rights have been neglected by the mainstream Bamar Buddhists though the region is rich in natural resources. China is going to invest heavily in the Rakhine region. It is going to develop the Sittwe harbor at a cost of US$ 7.3 billion. But Rakhine Buddhists wonder if they will get a share of the fruits of development or a chance to participate in the development of the region. The National League for Democracy (NLD) government led by Aug Sang Suu Kyi had refused to share executive power in the Arakan State after the Arakan National Party had emerged as the single largest party in the 2015 election. The NLD combined with the 12 army nominated members to form the government instead. Denial of power and other hall marks of discrimination have given rise to movements such as “The Way to Rakitha” and the “Arakan Dream 2020” which are based on the demand for self-determination. The Arakanese want “dignity” and “equality” which they feel are denied to them by the Bamar. The Rohingya Muslim issue had indirectly helped boost Rakhine Buddhist separatism. While fighting against the Rohingya Muslims, the Arakan Buddhists realized that the only language that the Myanmar government will understand is violence and that Rakhine nationalism will be served best by fighting the State with arms. Things turned ugly in January 2018. Violence broke out during the Rakhine nationalist commemorations to mark the 233 th. anniversary of the fall of the Arakan kingdom to Bamar invaders in the Rakhine town of Mrauk U.
Demonstrators tried to seize the local General Administration Department (GAD) building. GAD is a powerful civilian agency but controlled by the military. Security forces reacted by shooting dead seven Rakhine Buddhists. Subsequently, on January 30, Mrauk U’s former town administrator, Bo Bo Min Thaik, was murdered and his body left to rot on a roadside. Interestingly, the Arakan Army was born, not in Arakan, but in the Kachin state bordering China, where it forms part of the China-backed, United Wa State Army (UWSA)-dominated Northern Alliance. The Northern Alliance (NA) is a coalition of ethnic armies. At present, it includes the Kachin Independence Army (KIA), the Myanmar National Democratic Alliance Army (MNDAA), the Ta-ang National Liberation Army (TNLA), and the Arakan Army (AA). The Arakan Army and its allies in the Northern Alliance are of greater concern to the Tatmadaw than the Rohingyas’ Arakan Rohingya Salvation Army (ARSA). 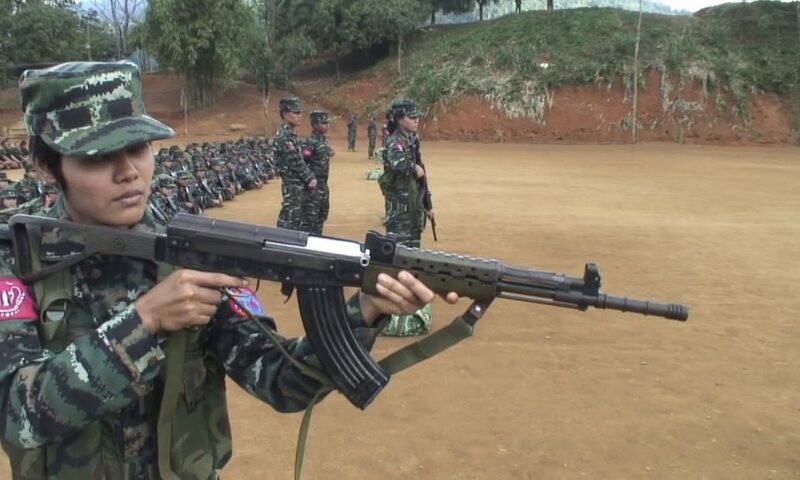 This is because unlike the poorly armed ARSA, the Arakan Army and its allies are well equipped and organized. The Arakan Army also has militant cells in towns to plant IEDs to kill security and civil officials. Furthermore, unlike ARSA, which has no foreign support, the Northern Alliance is believed to have China’s support. The government in Yangon is unable to tackle China on this issue because China backs it on the highly embarrassing Rohingya issue in the UN and in other world forums where the Yangon regime is pilloried for its abominable treatment of the Rohingyas. This suggests that in its dealings with the Rakhine Buddhists, the Yangon regime cannot take measures like wholesale expulsion as it did in the case of the Rohingya Muslims. It has to negotiate an end to the conflict across the table at some stage or the other. But given the power of the Tatmadaw even over civilian governments in Myanmar, a negotiated peace with political accommodation appears to be a far cry. The Bamar loathe giving any concessions to the Rakhine Buddhists despite the religious affinity because in competitive politics, every distinction is exploited to get the maximum partisan benefit.